I've come across many laptops and computers to fix. HP's are the worst. Good for us, we technician, we get job to open up and fix it up. But from consumer's point of view, most of the HP laptops before 2009 are havoc. The most notable problems with those laptops are over-heating issues, noisy and faulty fans, flaw design on how the chips are seated on the board, power adapter problems etc. I've seen HP laptops with power problems. They don't supply power at all to the laptop. The power jack on the laptop is fragile and faulty. Even the small bend during those carry here and there moments, it's prone to disaster. The only solution to these kind of problems is to resolder/rewire the connection on the power jack of the motherboard's from where it gets the power. 1. Unplug battery, power cord and press/hold power key for 30 sec. And, plug everything back on and try it back on. This is usually useful for battery drain problems and sometimes could act as problems for display too. 2. Try the external monitor to make sure it's not the LCD problems. If external monitor displays things, it's LCD issues but if not, it's motherboard to blame. 3. Suffocate the laptop, block all the air coming in/out through. I mean completely block the fan, ventilation of the laptop and leave it on for at least half and hour. Then, turn it off and turn it on instantly. You could use pillow or tape to cover all those ventilation on the laptop. The reason for this is to melt down any residue that's blocking the conductivity of any chips. This is a temporary fix. This problem is prominent on HP pavilion series of Laptops. Mostly the video chip Nvidia is badly located on the board. It has BGA structure and it keeps melting over the persistent use of 1 year or so. One day, it doesn't conduct the electrons because of that and what you get is the blank screen. The only solution for this problem is to resolder the balls , seat it back. A copper layer in between could resolve the problem in future once and for all. But this involves very careful and delicate work. It needs experienced hands. One slight slip through, and motherboard could be completely dead. 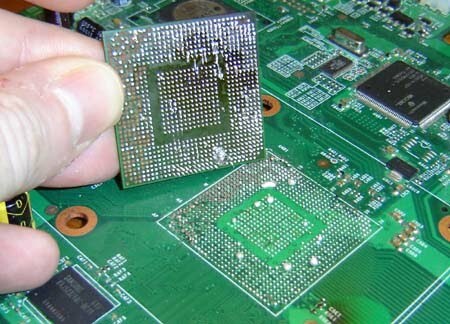 If you could replace all burnt/bumped resistors/capacitors on the PCB, may be it might come back to life (before you throw the motherboard thinking it's dead) but who would go through all that hassles. Last year, HP recalled their laptops for faulty battery. Battery that would explode. They should recall for faulty Nvidia video chips too. Strangely, every laptops I worked on, when I tried to find out if there is any warranty left using the service tag in the back of the laptop, I usually found it missed just by a month or two or in some cases few months. Those of you, whose laptops still working consider yourself lucky. You didn't have to go through all the agonies. May be you are not using laptop that often. HP laptops are very very fragile and it's not for long hour continuous use. It gets heated up easily and puts your motherboard components at risk because of it's carelessly assembled parts inside. And, these SOB's are damn expensive. One of my customers was like " I paid $1000 for this just last year". Damn, I could understand their frustrations. If I were you, I'll definitely look around instead of HP brand. Oh, one more thing, I tried to talk to HP customer support if they could help me if I had a problems. I pretended I had a Black Screen Problem with my HP laptop. I was taken to some tech support guy from India or Bangladesh(I don't know but they're from that part), and they slapped me with $398 bill for motherboard replacement plus taxes and other fees after asking me few questions. Several other lines they fired up was asking about my debit/credit account to charge me instead of giving me possible solutions. If I were some other average user, I would have fallen on their false pretense. And, I disconnected without a word. This could be fixed with BGA reflow. But they tried to sell. Now, I consider this, as totally moneymaking scheme instead of consumer oriented. Those HP tech-support guys are coached to sell things not to help. I'm not endorsing any other brand on my post here. Hence, my post is honest straight from the heart and not intended to defame reputation of certain brand. It's what I see and feel. With my experience, it's better off , skip over anything HP related. I work as a computer/laptop tech and I see ATLEAST one of these per week. I feel bad for the customers, truly. Somebody needs to class action those buttheads. This reminds me of the XBOX 360 with its Red Ring of Death. i , too has the same problem Im facing now . blank screeen can not boot there is LED lights but screen is black. i tried to bring it in repair center . too bad its warranty expired .until now im trying to figure out how to revive this expensve HP laptop which i bought 1 yr ago.